$25,000 is needed to initiate the funding process of a faculty chair which is considered endowed when it reaches the $1.5 million level. Endowed faculty chairs help support the salaries of named professors and assist in their research and service endeavors. By supporting a faculty chair, you help Dallas International continue to attract highly qualified faculty members and minimize student tuition. Gifts to an endowment may be made in cash, stocks and bonds, personal and real property, or through trusts or other planned arrangements. Gifts may also be made as pledges over a five year period. Dallas International has one faculty chair which is currently being funded – the Mayers Endowed Faculty Chair of Applied Anthropology. However, we welcome the addition of other faculty chairs in any of the following areas: Applied Linguistics, Abrahamic Studies, World Arts, Language and Culture Studies. 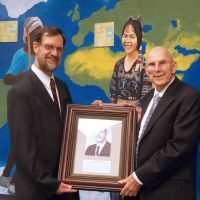 Mayers Endowed Faculty Chair of Applied Anthropology – Dr. Marvin K. Mayers was a distinguished figure in evangelical missiological anthropology. In recognition of his teaching, writing, research and visionary leadership in this field, the Board of Trustees of Dallas International University, established the Marvin K. Mayers Chair of Applied Anthropology in 2012. For more information click here. The chair affirms the importance of applied anthropological study in Dallas International’s programs. As of March 2019, the Mayers chair endowment stands at over $47,200 of the needed full figure of $1.5 million. For questions regarding contributions to the Mayers Endowed Faculty Chair of Applied Anthropology or the establishment of another faculty chair, please contact the Dallas International Development Office at 972-708-7552 or development@diu.edu.